If your friends could describe you in three words what words would they use? No, Harry Potter fan doesn't count. We're looking for three adjectives. Yeah, daring, courageous, and chivalrous works! Hey, what do you know, those are the elements that'll get you sorted into Gryffindor! You might think that courageous and daring is the something but it turns out that daring is more about being adventurous and courage is all about sticking to a task even when you feel afraid. For example, you keep walking into a den of giant spiders even when you've got a bad case of arachnophobia. Looking at you, Ron! Gryffindor is a house for people that care about their friends and care about what's right. The students from this house don't always get the best O.W.L scores, they can be a little preoccupied with taking down an evil force that's trying to take over the world sometimes. But, just because their grades aren't always the best (and sometimes they are) that doesn't mean they aren't smart! After all, it takes a lot of brains to figure out where the Chamber of Secrets is actually hidden. You'll look perfectly at home in the cozy Gryffindor House commons when you're wearing these lush robes. The black robe is lined with satiny red fabric and has a wide hood. It closes with a button at the top so you don't have to worry about it flying off as you're rushing to your potions class. 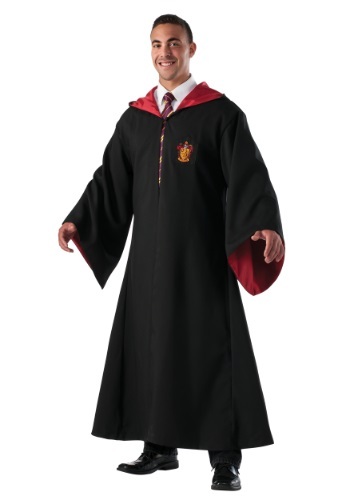 The sleeves are wide to make your spell casting more magical than ever!